Normally the perennial evergreen Iberis sempervirens doesn't excite me. I grew it for years, and always enjoyed the flowers in spring, when the evergreen plant became an ocean of white cascading down my rock wall. I grew tired of it and pulled it out, although I sometimes grow an annual version of candytuft. 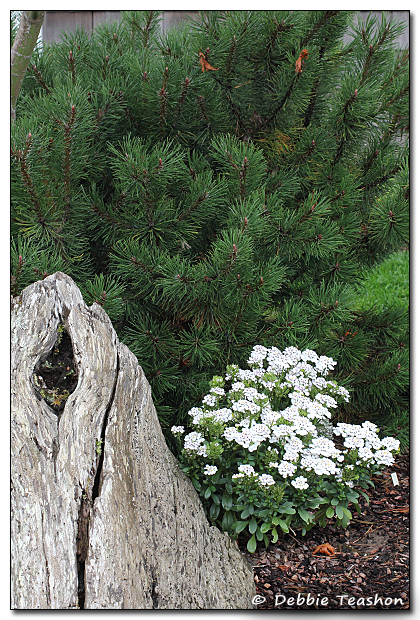 I enjoyed the interesting vignette in Judy's garden of a pine tree with candytuft and a handsome piece of driftwood—the reason I photographed it. My camera was giving me fits at the time I was photographing, so I was lucky I came away with any shots at all. Fast forward to the end of October, when I revisited her garden and there was the Iberis still blooming as prolifically as the last time I stood over it. 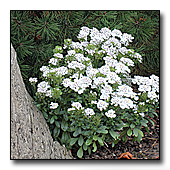 Candytuft has a very long blooming period, and Judy never deadheaded the plant! 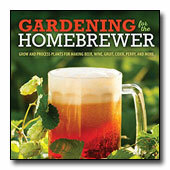 I need another look at this perennial. This hybrid needs to be growing in my garden again. Iberis 'Masterpiece' is its name, and flowering profusely is its game.